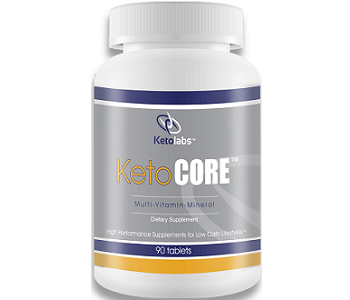 In this review of KetoCore, we will be looking at all the facts to see if this is an effective, affordable supplement that delivers the results you want. Unlike most keto supplements on the market, this specific product is designed to reduce symptoms experienced with low carb diets such as the keto diet. This product has a combination of probiotics, vitamins, magnesium, and electrolytes to maintain brain, heart and immune health. It is also said to increase stamina and energy levels while exercising. The formula contains vitamins such as Ingredients Vitamin A, C, D3, E and K1 which are beneficial for boosting the immune system, maintaining healthy skin and lowering cholesterol levels. Other ingredients that can be found are Lactobacillus acidophilus, a healthy probiotic that restores the body’s natural flora, Magnesium which is beneficial for reducing muscle cramps during intense workouts, and Coenzyme Q10 which is essential for energy production and reducing the signs of aging. It should be noted that this product only contains ingredients which help to reduce symptoms such as “Keto flu”, it does not work to put your body into a state of ketosis like many other exogenous ketone supplements do. Ketolabs recommends taking 3 KetoCore capsules a day with meals. The information provided is vague and does not mention whether all 3 capsules should be taken at the same time or in between each meal. While the manufacturer has not listed any side effects, this product does contain Niacin which is known to cause side effects such as tingling of the face, often called Niacin flush. This is usually temporary and should not cause any long-lasting concerning effects. The price displayed on the manufacturer’s website is $29.88 for a bottle of 90 tablets which has been disconnected from the original price of $59.99. This product is also available for purchase from third-party retailers at a cheaper rate, you may need to do a price comparison in order to get the cheapest deal. We were unable to find any guarantee for this product which may mean that the manufacturer is not confident in this formula delivering effective results. The feedback from end users is mixed however, there seems to be a common trend amongst the negative reviews, most of whom are under the impression that this product is meant to put you into a state of ketosis. The manufacturer has not made it very clear that this product is only a multivitamin to be used in combination with a keto diet. A few other disappointed consumers commented that this product was expensive and that it had turned their urine a bright yellow color. Overall, this product may be beneficial in supplementing your body with nutrients and vitamins it may lack due to low carb diets, however, it is important to note that this product is not designed to put you into a state of ketosis, it is merely a multivitamin that has added probiotics. While some have mixed feelings about this product, the one thing we can agree with is that it is not very affordable considering the dosage and lack of bulk purchase discounts. We feel that the manufacturer has been vague about what this product does and the fact that there is no money back guarantee may mean that consumers are losing out on money by purchasing a product that is not going to aid in weight loss by inducing a state of ketosis.